Well, better late than never. I have spent the last ~125 weeks wrapping up loose ends by completing a college degree that began many years ago. 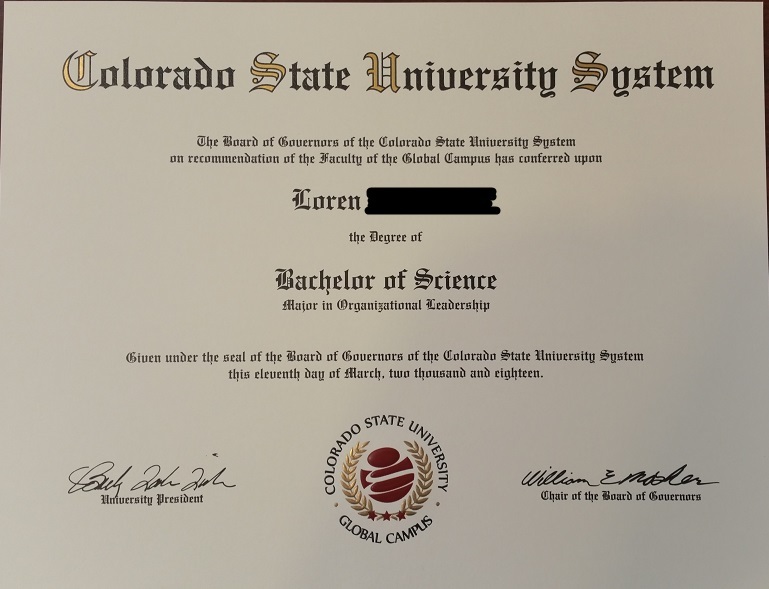 About 600 pages of essays later, and countless hours of reviewing research papers, my labors have culminated in a Bachelor of Science degree in Organizational Leadership from Colorado State University. This was probably one of the hardest things I have done in my life. More than anything, overcoming my self-imposed mental and emotional challenges far exceeded the academic rigors required. I had to find an additional 30 hours in an already busy week to commit to my studies, all of which came at the expense of sacrifices to time with my daughter. This was my greatest frustration. I will be grateful to have my weekends back, and precious time to spend with her. Most importantly, I have persevered and finally reached the finish line, though there were many times when I thought it would never come. In doing so, I have set an example for my daughter about the importance of an education, and further that rewards come with hard work and determination. Just wanted to share this achievement with you all, and reassure you that its never too late. Pretty great news Loren, and a big congratulation is deserved! Hope this will lead to all the hopes and dreams you intended. It certainly couldn't have been easy, given your other commitments. Congratulations, that’s a wonderful achievement. Real happy for you. Setting the example for your daughter...you are a good dad...proud of ya! How do you pronounce your last name? Is the "Q" silent? The last name being crossed out. Bad joke on my part I guess..... Sorry! Congrats! That is a major life accomplishment! Hey Congrats Loren! Better late than never. Great job! I've always thought about going back myself. The truth is, old dogs really can learn new tricks! Bravo! That's truly brilliant news; a huge well done! I've trod that path, completing a degree then a Masters whilst working full time and with two young children, so I fully empathise! And your point ref modelling excellence for your daughter is spot on. Your degree title caught my eye too.... I'm an organisational development practitioner and my masters is specialised in leadership! Now, what will you do to celebrate?!?! Thanks, gentlemen. It means a lot to me and I appreciate all of the congratulations. I don't have much in the way of friends or family so it means a great deal to be able to share this event with someone. An added benefit of completing this degree is the pride my father is feeling. At 87 years old, this was a goal he had hoped I would strive to achieve. He has always valued education and can now say that all of his boys (3 of us in total) have college educations. I'm glad I could do it while he is still around to witness it. That is excellent, Stick! I love this degree because it transcends industries. Strong leadership is critical for the success of modern organizations. As for the celebration, I've scheduled some time off in June to grab my fly rod and head for the Eastern Sierras for some camping and trout fishing. Really looking forward to it. A huge congratulations Loren, all that hard work is now paying off. Good on you, mate. It's quite the achievement! Especially considering that at your age, learning is more challenging than when you were in your teens or twenties. So, seriously, congrats as what you did is not easy at all. I also hope it will open up great opportunities for you. Congratulations Loren! You should be very proud of your accomplishments. One of the several careers in my life was working for private colleges as Admissions Director. One of those was for an adult degree program...a one night per week design with classes done in sequence. It was very, very rewarding work. I also taught several of the upper division classes...Organizational Behavior for one. All that to express that I know very clearly how hard you have worked to complete your degree. It could arguably be considered your life’s most significant achievement. I am very proud of you on many levels...perhaps mostly for the example you have set for family, friends and co-workers. Truly...you have my sincere respect. Thank you all for your kind words. I am deeply grateful.